Description Create 2D and 3D volumes from gathers by stacking traces. This process creates stack volumes from gather data according to the specified stacking mode, optionally applying an inner and/or outer mute. Apply positive and negative offset limits to define the included range of offsets. Traces with offsets outside these limits will be ignored. 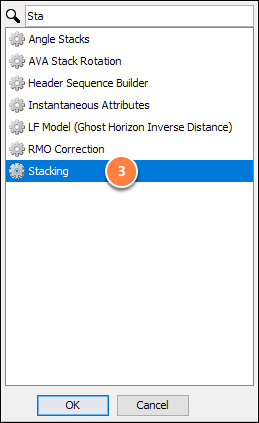 Scroll down and double-click on Stacking. In the Details Panel, select the gather Volume. If mutes are not specified, all traces in the gather are stacked. Both hand drawn and angle mutes can be used (see Manually Picking a Mute and Creating an Angle Mute). Enter the Ramp Distance (m). Blackman — Same as offset, with the input values being weighted by a Blackman window rather than the offset, such that the near and far offset values are damped relative to the mid-offsets. Hamming — Same as Blackman mode, with a Hamming windowing function used in place of the Blackman windowing function. Median/mean — Returns the mean of the values within "percentile" of the median. 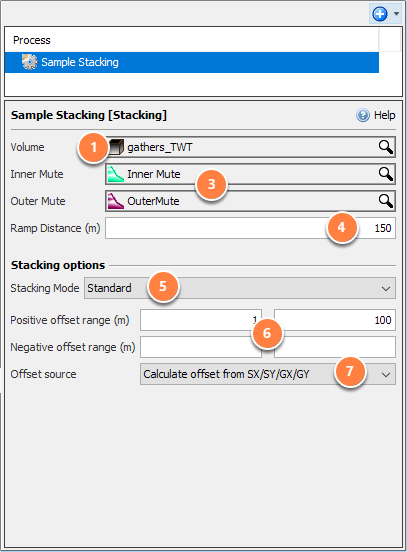 Optionally enter the Positive and Negative offset ranges (m) to set the range of traces to be considered. Traces with offsets outside these ranges will be ignored. Calculate offset from SX/SY/GX/GY: Calculating offset from the SX, SY, GX, GY headers (honouring the SCALCO header). If mutes are applied, weights from ramped or smoothed regions are included in the stacking normalisation. Output traces have their NHS header set to the number of live traces that contributed to any sample in the stacked trace.